During the last three decades geosciences and geo-engineering were influenced by two essential scenarios: First, the technological progress has changed completely the observational and measurement techniques. Modern high speed computers and satellite based techniques are entering more and more all geodisciplines. Second, there is a growing public concern about the future of our planet, its climate, its environment, and about an expected shortage of natural resources. Obviously, both aspects, viz. efficient strategies of protection against threats of a changing Earth and the exceptional situation of getting terrestrial, airborne as well as spaceborne data of better and better quality explain the strong need of new mathematical structures, tools, and methods. Mathematics concerned with geoscientific problems, i.e., Geomathematics, is becoming increasingly important. 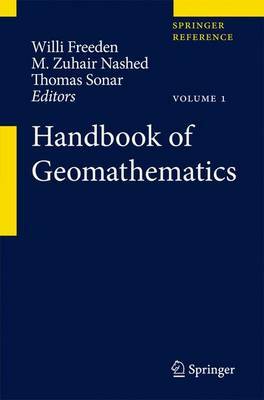 The `Handbook Geomathematics' as a central reference work in this area comprises the following scientific fields: (I) observational and measurement key technologies (II) modelling of the system Earth (geosphere, cryosphere, hydrosphere, atmosphere, biosphere) (III) analytic, algebraic, and operator-theoretic methods (IV) statistical and stochastic methods (V) computational and numerical analysis methods (VI) historical background and future perspectives.